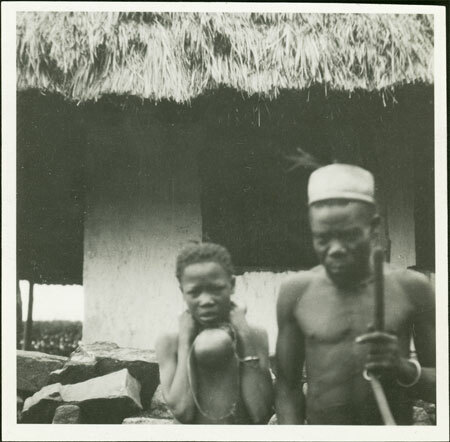 An upper body portrait of a man wearing a brimless straw hat (probably a Zande) and a girl with what looks like an iron collar with ball attached, both slightly out of focus, standing in front of a pile of stones (a grave?) next to a thatched rectilinear building with whitewashed walls. The iron collar may be a form of punishment? Morton, Chris. "Zande man and girl" Southern Sudan Project (in development). 03 Jan. 2006. Pitt Rivers Museum. <http://southernsudan.prm.ox.ac.uk/details/1998.353.45.2/>.